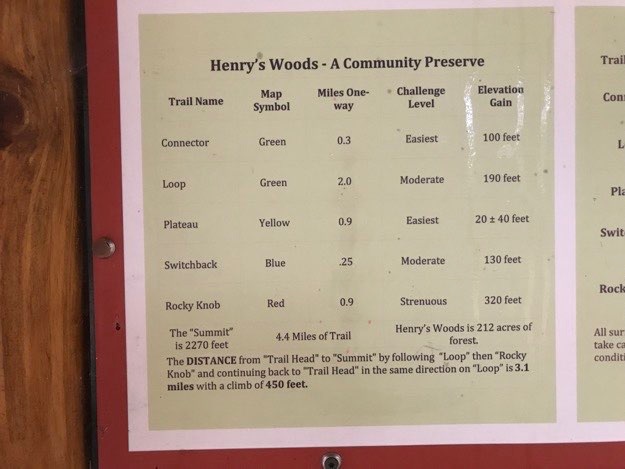 We took a nice little stroll through Henry’s Woods, a newer multiple-use trail system that is on the easy side, yet still incredibly rewarding. 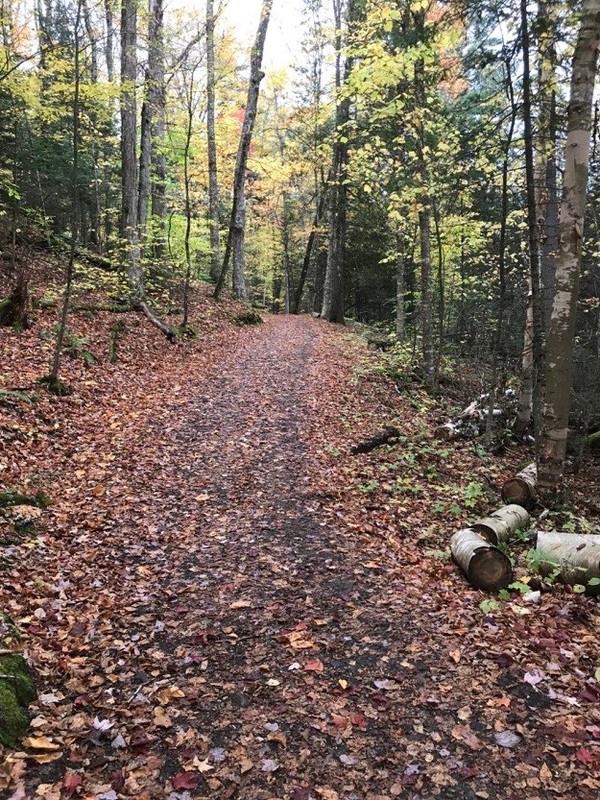 The trails are wide and well-graded, and consequently very family- and dog-friendly. 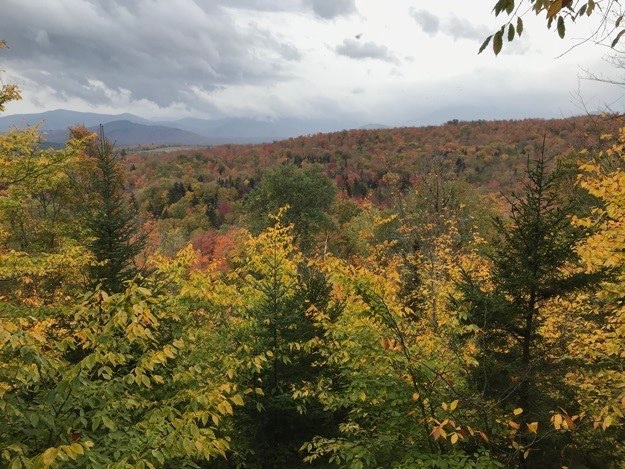 We spent a drizzle-filled morning hiking there in October, and really enjoyed hiking through the dense hardwood forest, up to the top of Rocky Knob, where we were treated with some great views. 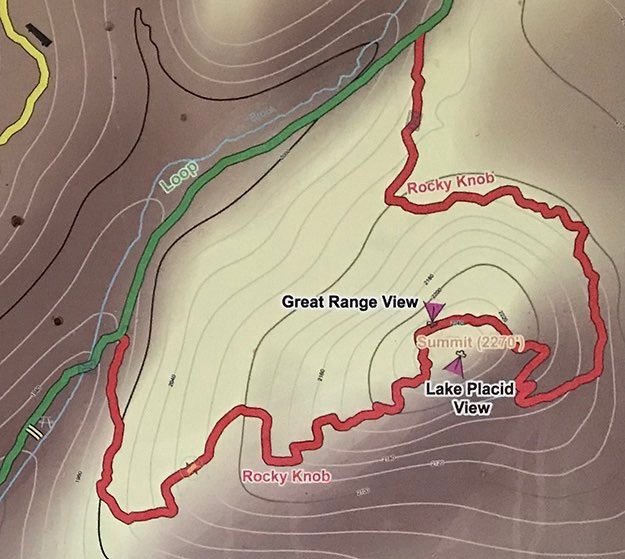 Our hike was about 2.3 miles, round trip, with an ascent of about 450 ft. 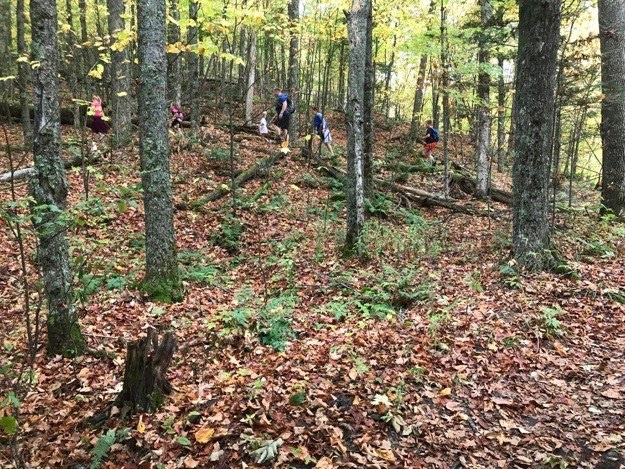 The hike up to the summit was hardly a climb, due to great trail architecture, with switchbacks to take out the steepness. 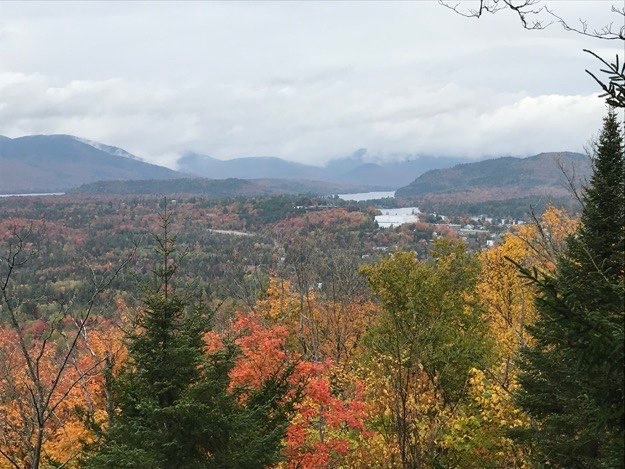 We had views of the Lake Placid village area, and some of the high peaks as well. 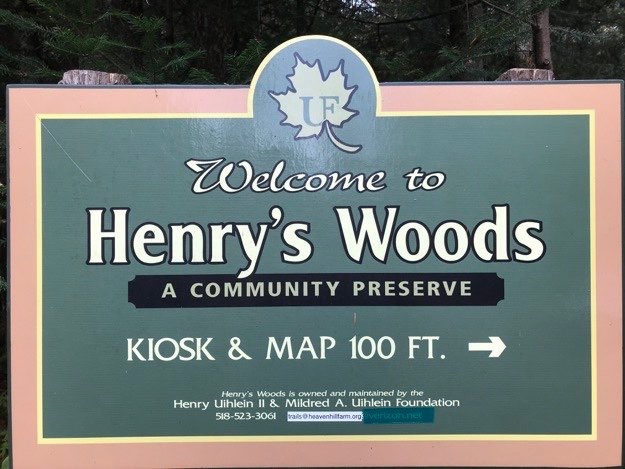 If you’re looking for a hike that even a 3 or 4 year-old can handle, put Henry’s Woods on your short list. 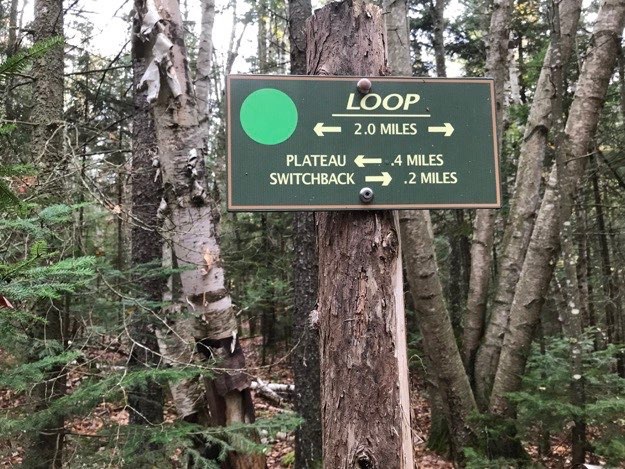 The first trail junction, where we met up with the green loop. We hung a right, heading west. 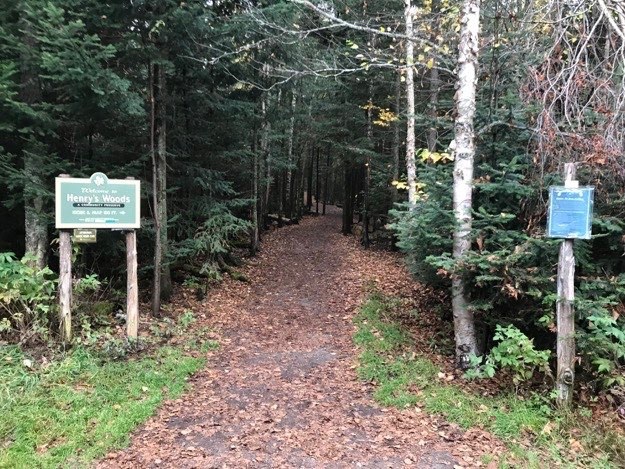 The sign that greets you from the trailhead. 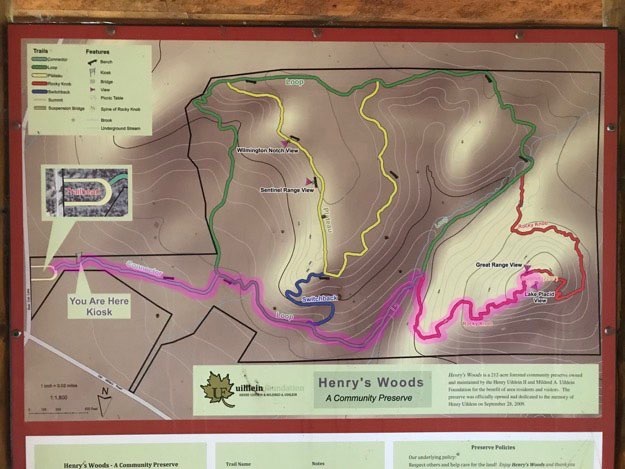 A list of the trails and distances. A zoomed-in view of the sign. 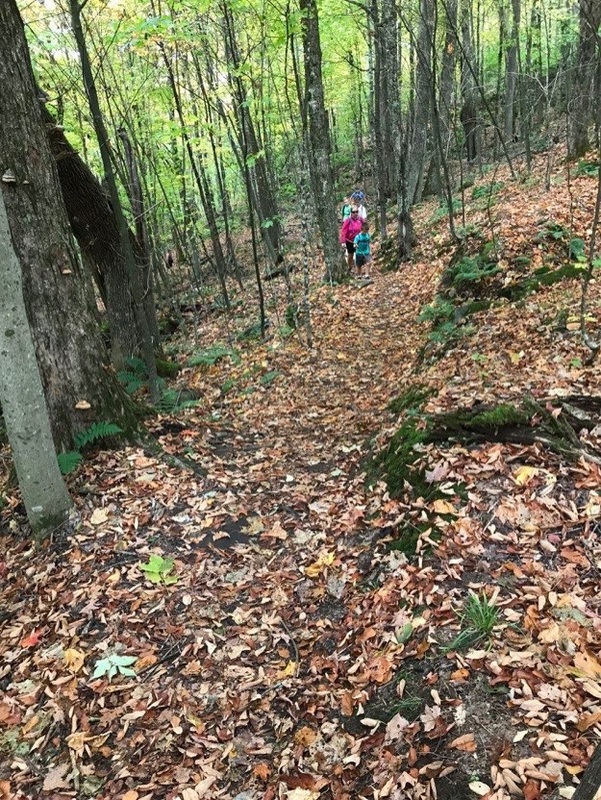 We’re heading right, in the direction of the Switchback trail, (and beyond). 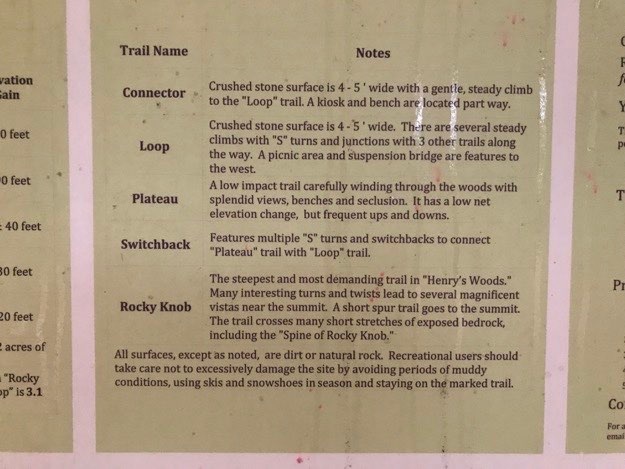 Some descriptions of each of the trail names. 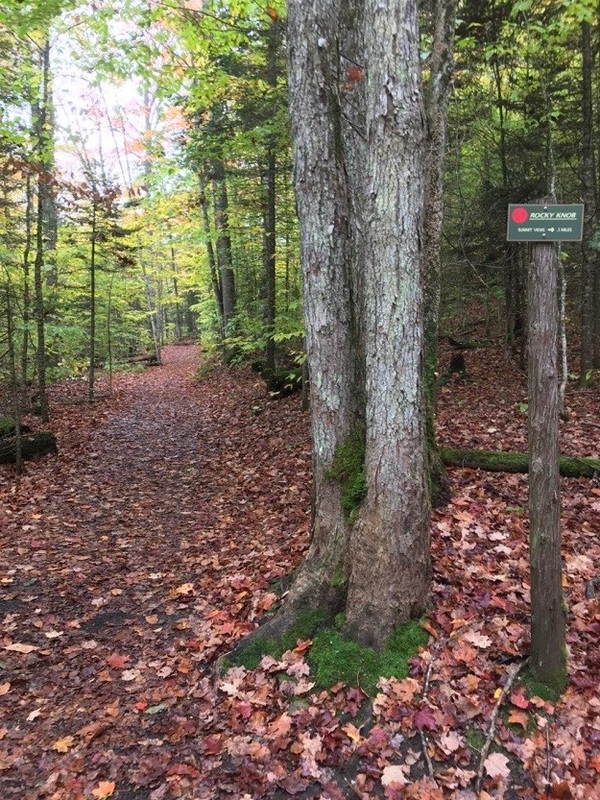 The wide, flat and gentle trail is multi-use, including walkers, hikers, runners and bikers. 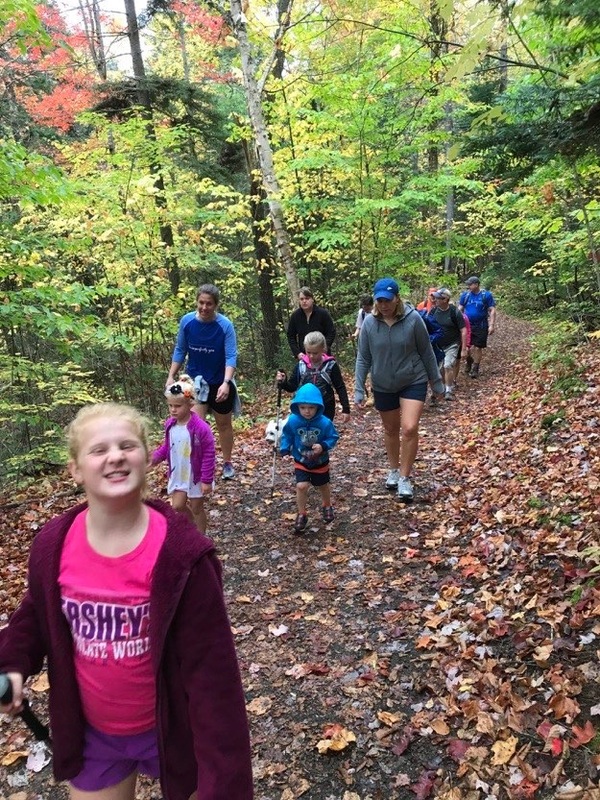 We have a large contingent of young kids, so this kind of trail is perfect. 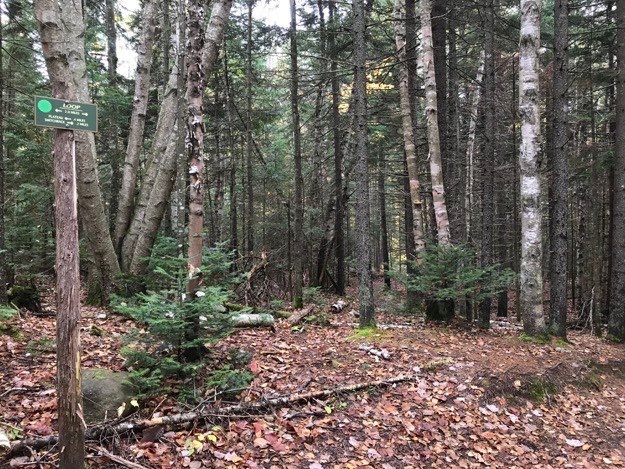 Another trail split, There’s a sign on a barkless pine stake to the right, (difficult to see). Again, we head to the right. The aforementioned sign. 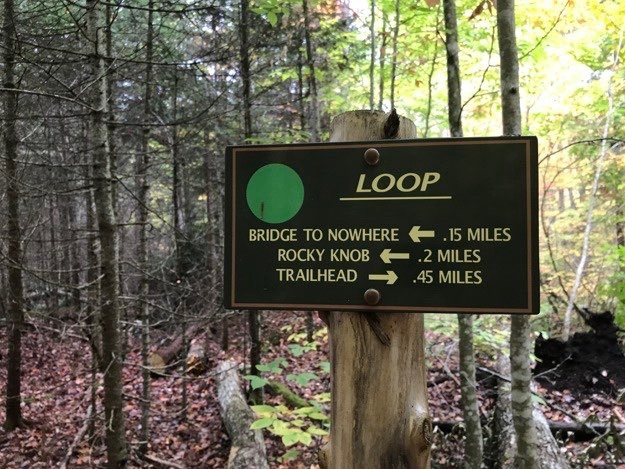 We’re going to visit the mysterious Bridge to Nowhere, and Rocky Knob. 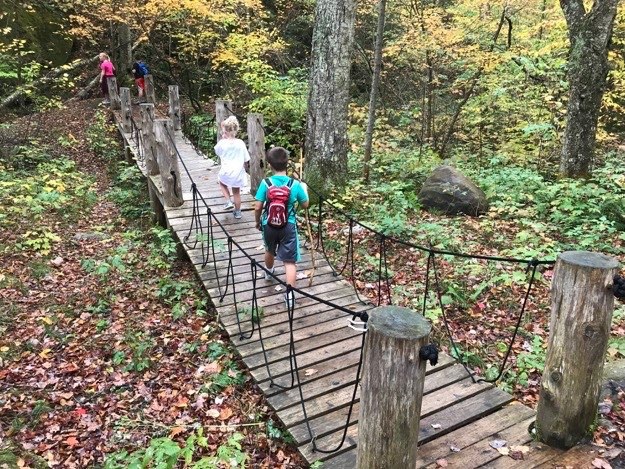 My son Nate follows some of his friends across the “Bridge to Nowhere”. It is a whimsical suspension-style bridge built by the 46ers out to a huge boulder, which ends at a small stream. It literally goes nowhere. 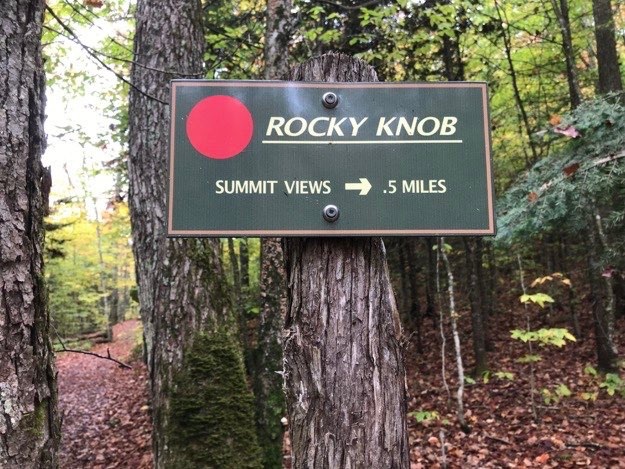 Soon after the bridge, we take a right, onto the red trail to Rocky Knob. It’s only half a mile up to the summit. 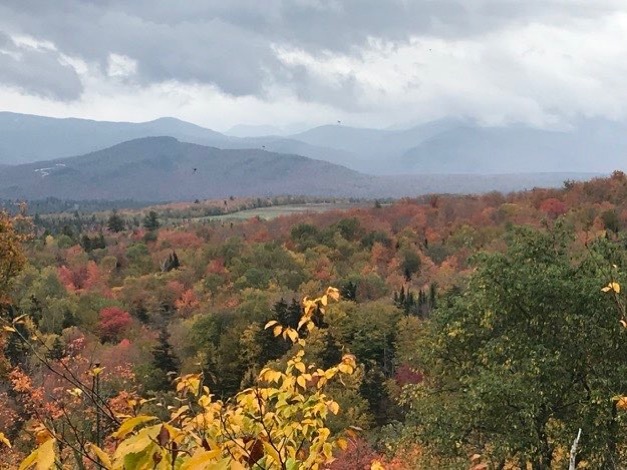 It’s enough to get your heart beating and have you huffing and puffing a bit, but it isn’t tough compared to all the other peaks on this website! 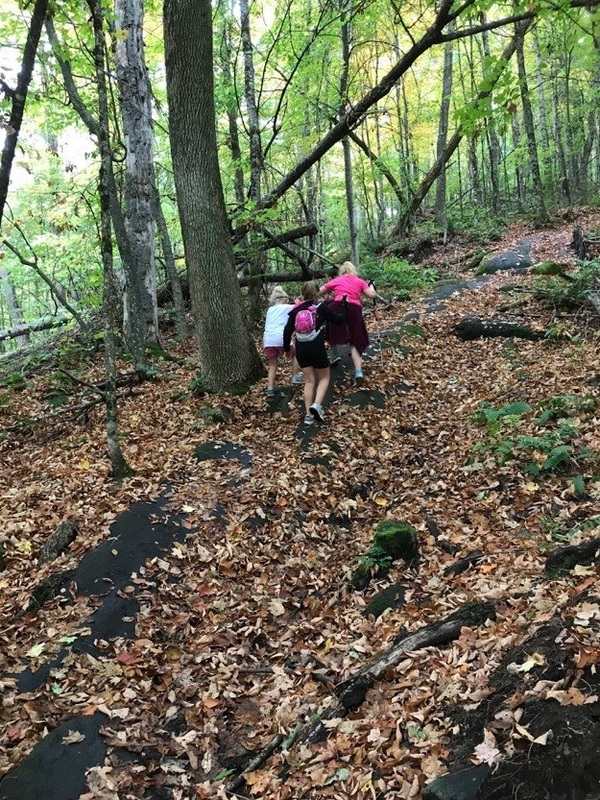 The girls enthusiastically climb the trickiest section of the trail, which was a long section of exposed rounded bedrock. It seemed like we were walking up the back of a giant apatosaurus. 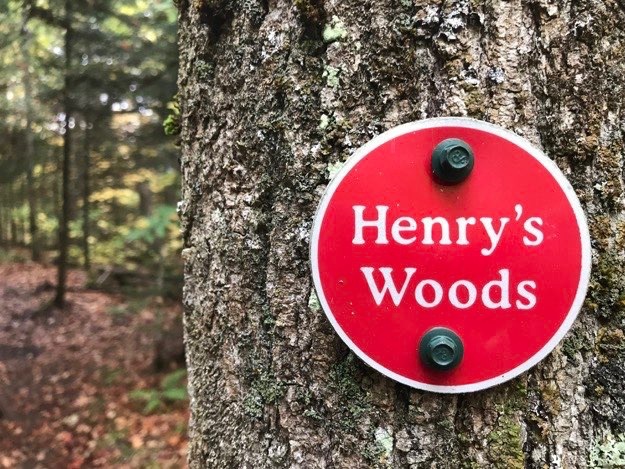 One of the red trail markers on the Rocky Knob trail. Nate leads the way up the trail. 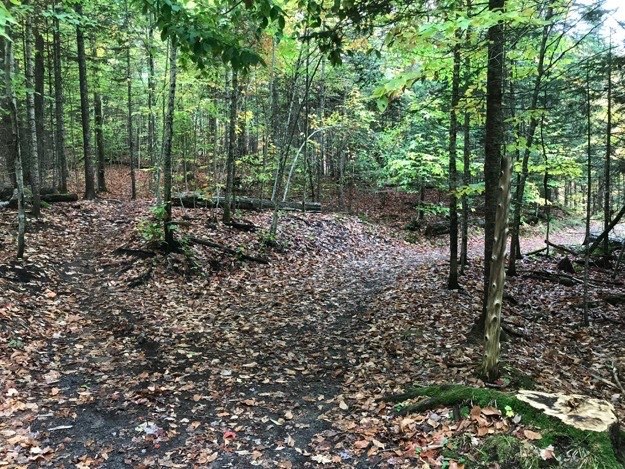 One of the switchbacks meandering through the woods. 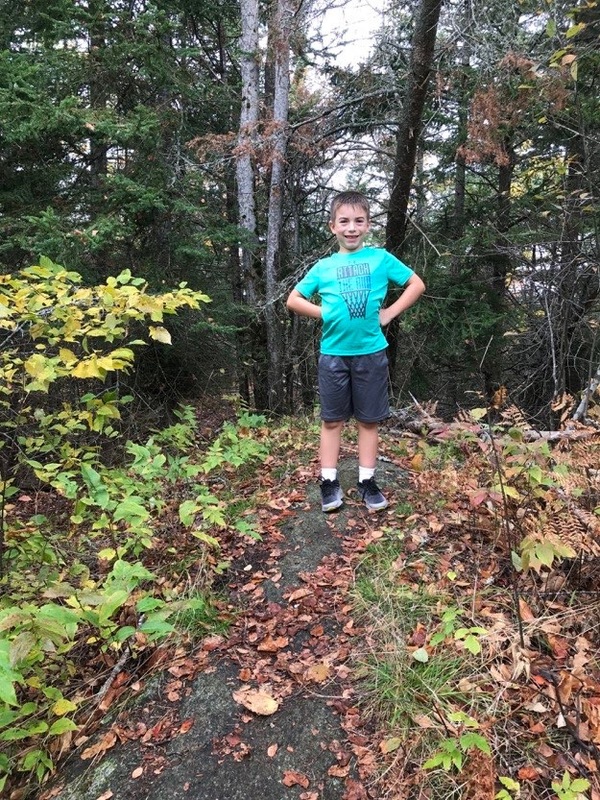 Nate stands triumphantly on the summit of Rocky Knob. 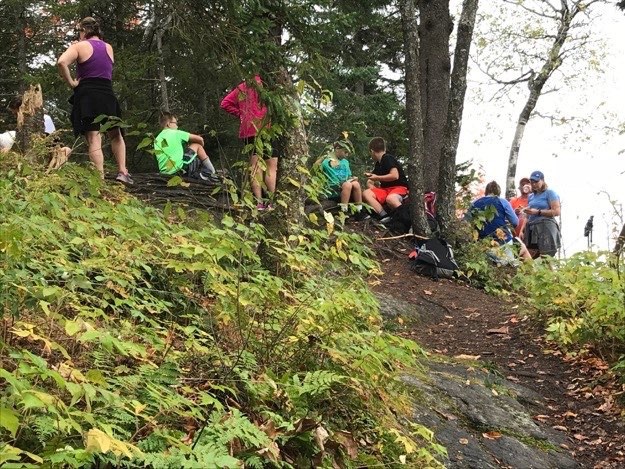 We all pause for a quick picnic lunch near the summit, at one of the two viewpoints. 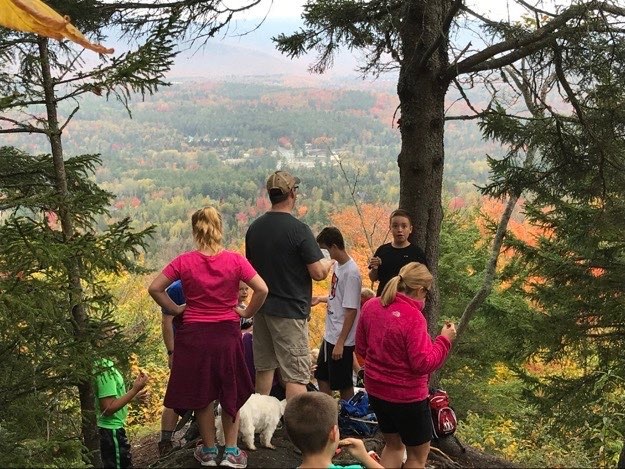 You can see the outskirts of the village of Lake Placid in the distance. 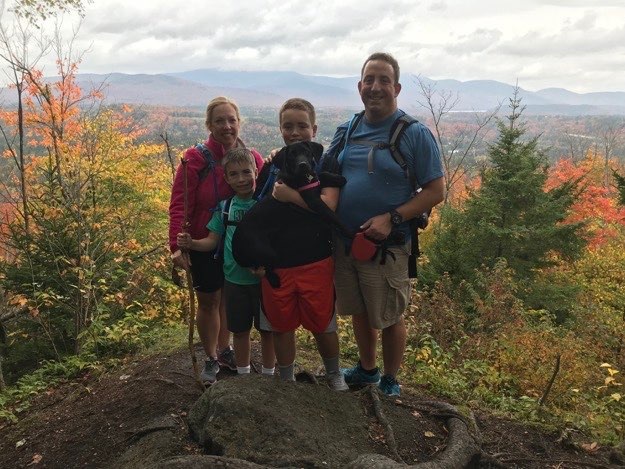 Our family picture, from L to R: Jen, Nate, Alex holding Leia our new black lab, and myself. 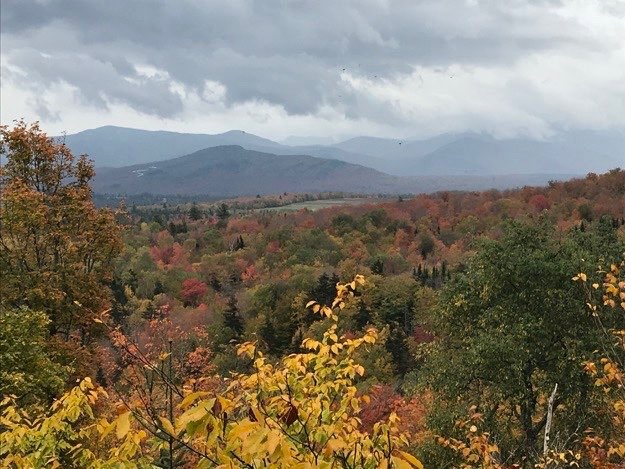 The view north, towards Lake Placid. 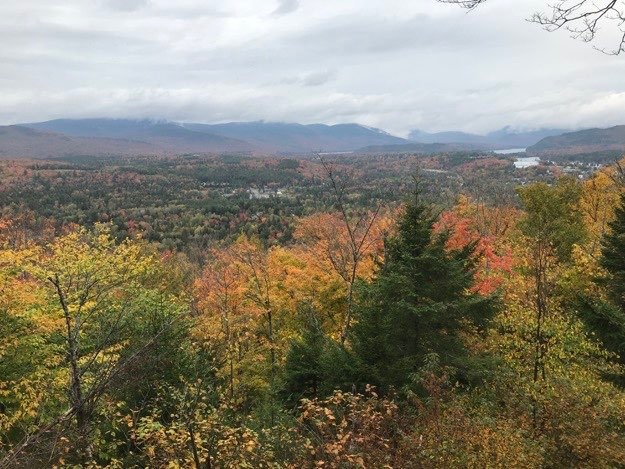 A bit more zoomed-in, you can see the white Olympic skating/hockey arena, with mirror lake directly above, then Lake Placid further on above that. Zooming in a bit, you can see Cascade and Porter in the distance on the left side, with Mt. Van Hoevenburg in front of that. A keen eye can even make out the white snake-like appearance of the combined luge/bobsled track coming down the mountain. On the opposite side of the summit is a different view looking Eastward. 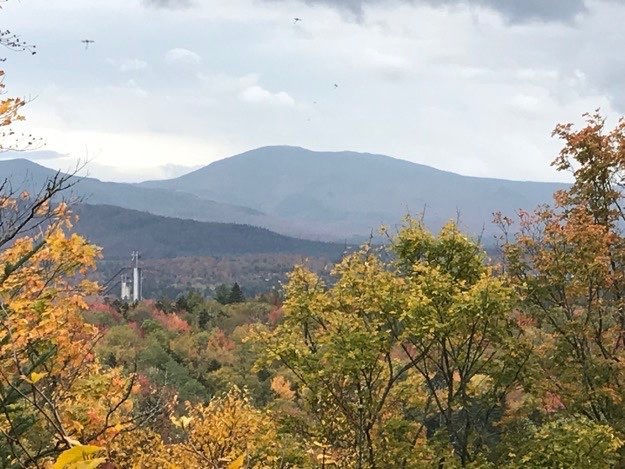 You can see some of the high peaks, (especially if there weren’t as many clouds, unfortunately). If you move around a bit, you can even see the Olympic ski jumping facility to the far left. A keen eye can even make out the white snake-like appearance of the combined luge/bobsled track coming down the mountain (far left). 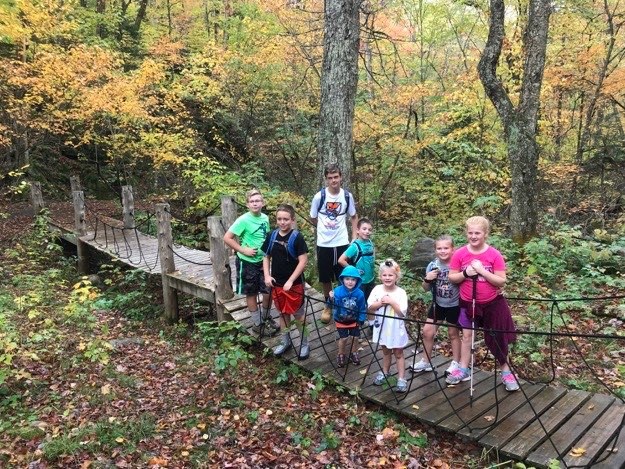 On the way back, we had to have all the kids pose on the bridge for a photo op.